One of my most treasured notebooks is my Daycraft Cookie Bookie, because of it’s so funky look, and rich orange pages. You can imagine my delight when I received a MyTravel Notebook from Shadow at Daycraft. Not only did I receive a MyTravel Notebook, I received three MyTravel Notebooks, so I gave two away! Thank you so much Shadow. Giveaway is now closed! Comes in three colors-Yellow map with Blue trim; Black map with Black trim; White map with Borwn trim. Double-cover. Extra-thick cardboard. The MyTravel notebook is designed to be extra-tough. Something I want to mention right off. If you decide to check out the Daycraft catalog, the listed prices look a scary to U.S. eyes–but those are Hong Kong dollars. The actual price differs daily according to the exchange rate of the day, but the Signature sketchbook I ordered was HK $89.00, which turned out to be U.S. $11.78. And even better? 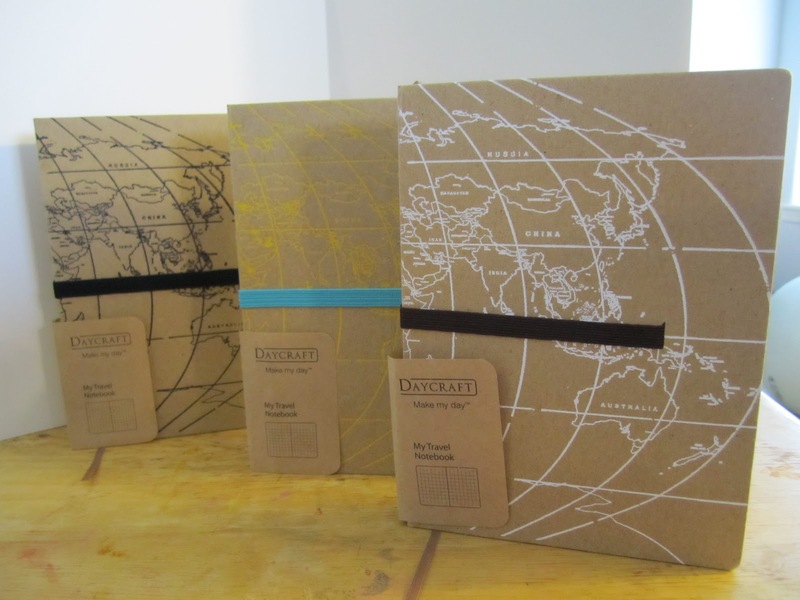 Daycraft offers FREE International shipping! Expected shipping time from Hong Kong to Oregon, USA is 15 days. The only hitch I had in ordering was that you are required to enter something in the 2nd address line. I don’t have an apartment or block number, so I just put dashes. I paid with Paypal, which gave me the price in U.S. dollars. The book lies flat,but the pages have some spring. 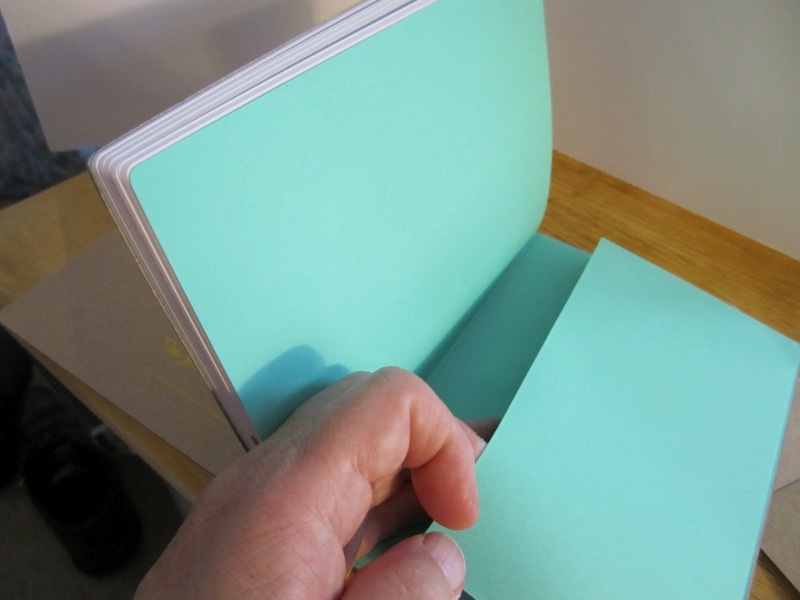 If you carefully bend the book backwards you can reduce the spring and the pages won’t try to flip shut (this is true of most quality notebooks). 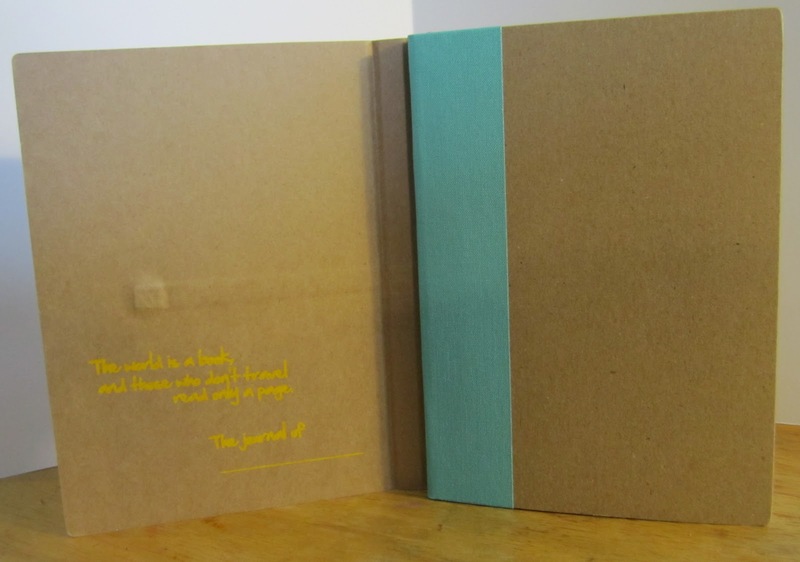 The extra cover flap is quite heavy and rigid, with a quote and a place to write your name on the inside. It would be a travesty, but you could cut this cover off and still have a perfectly good looking and usable notebook. The inside cover is lighter and flexible and would stand on it’s own. The paper is white, with a slight grayish tinge, which makes it easier on the eyes than bright white. The grid-lines are a light green. They might be too light for some people; others will like the fact that the lines tend to fade from notice once a page is finished. The lines are also numbered along the left page and bottom. There is no explanation on the site for the reason behind the numbers, but they would be great if you wish to draw charts or maps. The squares are larger than most I’ve seen (for this size page, anyway). 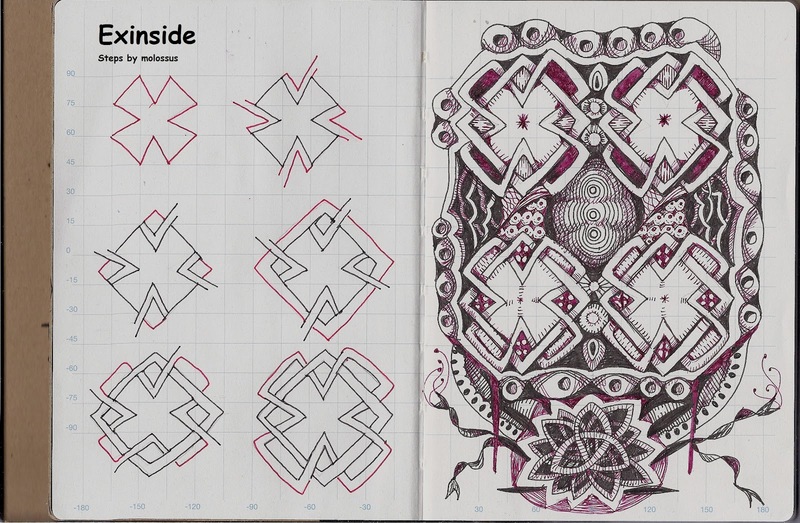 While still a helpful guide for Zentangle®-inspired pattern work, they are a bit large to use as the base for a pattern itself. The paper is very thin, but the cover is very thick so the overall weight of the book balances out. It isn’t remarkably thin or remarkably heavy. Even though the paper is very thin, it’s more opaque than you might suspect. The elastic band is different from most. The ends are glued near the middle of the cover. You slide the band over the top to the spine side while the notebook is in use, and to the open side to keep the book shut other times. I like the look but it does create a small bulge inside the extra-cover. Both cover and band are very sturdy, but there might eventually be wear or fraying at the insertion point. The extra cover can be doubled back to give a sturdier rest when drawing. It has the potential to flap down and unbalance the notebook if you are drawing in a standing position. 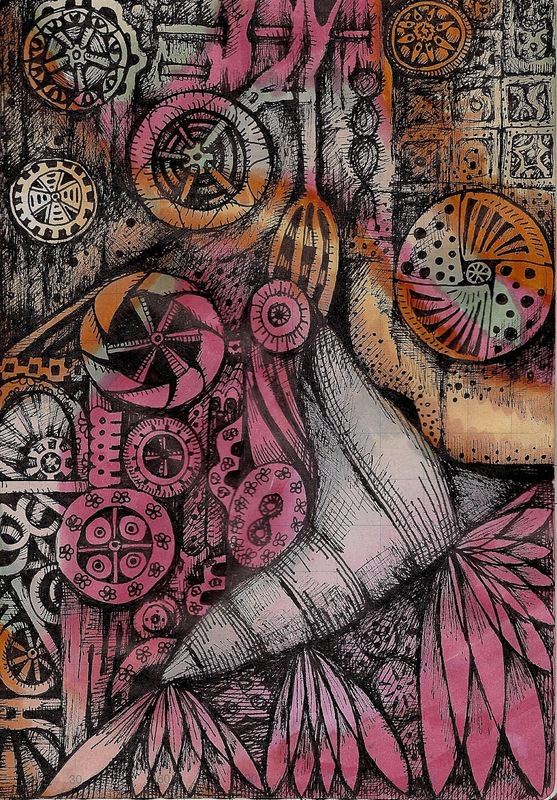 I used Noodler’s Black Swan in Australian Roses ink and a Pen and Ink fountain pen, medium fine nib, for color in this tangle, quite heavily in some areas. Fountain pen ink is notorious for showing or bleeding through. There was some show-through on the back, but I couldn’t get it to scan. It was so faint that I don’t believe it would bother anyone. The black was done with a Micron Pigma .03. The show-through and bleed-through can vary according to the pen and the ink used. I’m looking forward to some reviews by those use a variety of pens and inks. I used a Micron Pigma pen .03 and .05 for this drawing. The lines are crisp and bold, It takes a few seconds to dry so you could smudge the ink if not careful. Micron ink usually dries immediately, and doesn’t actually take long on this paper–just longer than usual. There is no feathering or bleeding and very little show-through on the back. Given the the color of the paper I was expecting that the color of my alcohol markers would be a bit dull. I was surprised to find it was quite bold, almost brilliant. In retrospect, I should have known based on the bold of the Micron ink. Bleed-through is close to 100%. I’m going to show you the back of this page, done with Tim Holtz Distress Markers. It’s a good example of dimpling. When I used the water brush on the markers, the paper dimpled and the texture changed, becoming crackly, but not brittle. It didn’t buckle–even though there was dimpling, there was almost no curl and the paper still hung straight. There was no pilling of fibers (and that’s a problem I’ve had with the Distress markers in the past). Now–here’s what the front looks like after I did some linework. The dimpling is still there but a great deal of it flattened out. 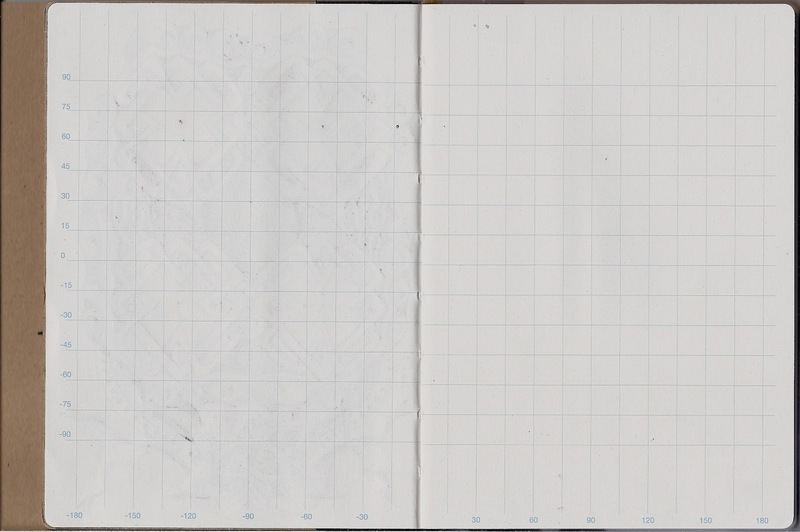 I wouldn’t recommend this notebook for watercolor sketches–and I don’t think many people would even think of using it that way because of the gridlines. 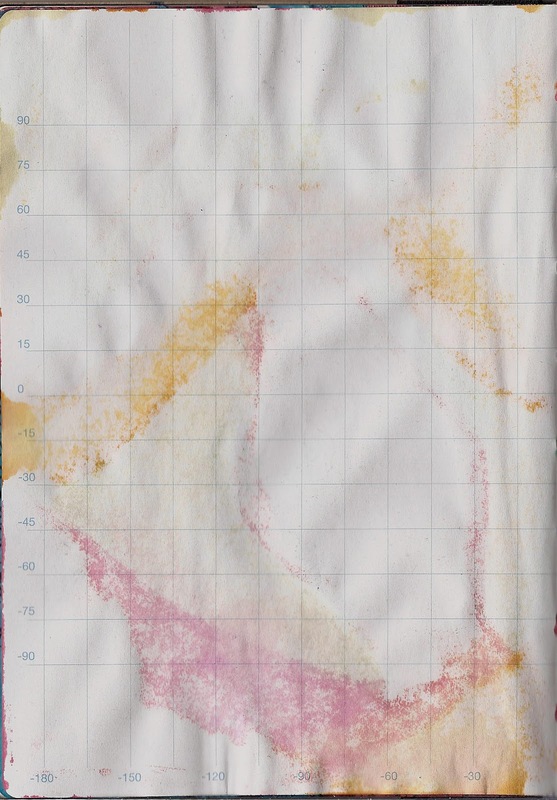 For art journaling, where different textures are a plus, ‘wet’ media would be fine. It doesn’t happen to me very often, because I like to fill a page up, but after I added a little pen work this just said ‘Done!’ to me. So, good or bad, I left it as is. In conclusion: The MyTravel notebook is sturdy, provides a clean, bold writing line, and it’s just plain funky. The grid-lines are light and don’t interfere with the finished work. While I can’t recommend it for wet media, it will hold up to most wet without pilling or curling. I personally find the Kraft cardboard and map design appealing and the paper enjoyable to work with. I’m very glad to have two of these notebooks to giveaway. 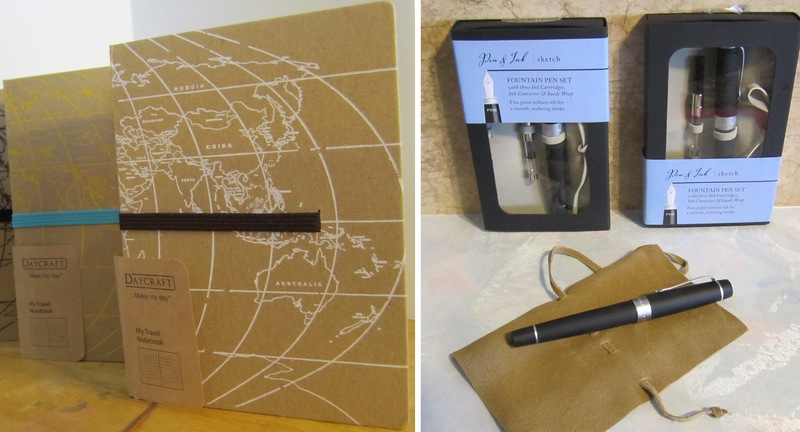 You can read more about the MyTravel Notebook in this Daycraft recent news article and if you don’t want to wait to see if you have won, you can order one now. The Rules: Here’s the thing. I’m holding two giveaways. One person will win on my Blogger blog, and one will win on my WordPress blog. I’m using Rafflecopter on here, so Be sure to click on ‘+1 Do It’ in the Rafflecopter box and it will open with a box for you to leave your comment. Once you leave your comment, other ways to enter will appear. My heart started skipping when I read your review – I'd love to try one so thanks for the giveway chance. I've just got my first Rhodia Dot Grid thanks to your review & am utterly delighted. New to tangling I'm finding your blog an invaluable resource. I love the pages you did to try out this great journal! I really like the size and have to say it…the grids. They are a little large but it helps me focus on my work. Thank you so much, as always, for your generosity and thorough review!! Be sure to click on 'Leave a Blog Post Comment' in the Rafflecopter box. It will open and you can leave your comment there–otherwise it doesn't get captured in the giveaway. ooh, the notebook looks great, but the pen leaves me salivating a little bit… mmm…. sandra, your pages are always sooo beautiful. I love the sturdiness and the graph pages – and that I can experience it as a gift from you! With a cool pen to try. 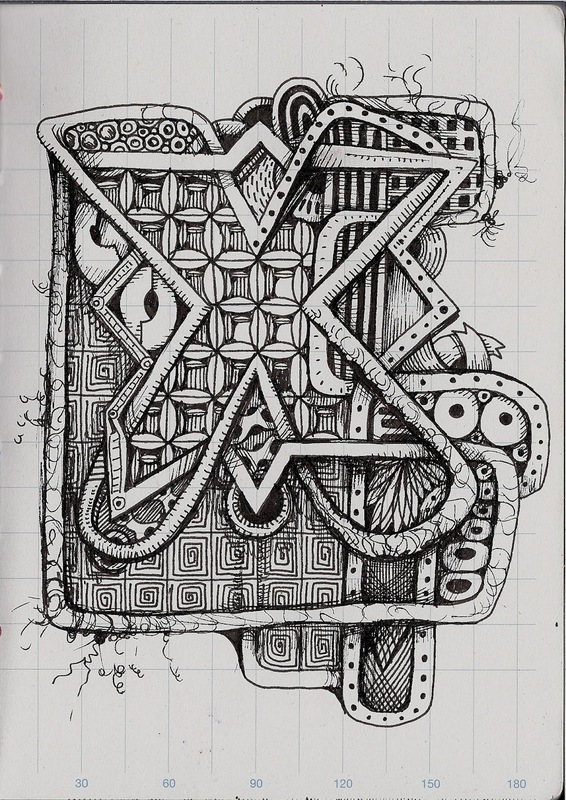 PS – love the new tangle – trying it now. I love the outside… is that weird?? Quite simply, I love the cover! It's very pretty and unique. Regardless of the type of paper inside, I'd just work with it depending on what pens it would handle, because I'd still get it for the cover! There are so many upsides in this journal, hard to list them all! Sounds like a good one o try. Love that the inks didn't run when you stamped!!!! Your post is SUPER!!!! LOVE all your tangles!!! The review looks great….Hope I win! woot thanks for a chance to win! Love to open a new book and hearing the crisp papers rustle together. Very cool book – love the graph marks! I love any paper produce with a map theme. Thanks for the giveaway, Sandra! I just like the size and simplicity. I has everything you need. The pages are great for lists or drawings or sketches. The look is great and the fact I can use my fountain pens in it is a plus. I have always liked maps so this notebook has an attraction for me. Those pens look really cool and the notebooks look great. Loving your artwork mostly. I wish that I had those skills. The notebooks are nice and everyone loves a fountain pen. I'm interested to see how the bulge interferes with using the notebook. Bridgett, the bulge might interfere with drawing on the back of the front page–maybe, if you hit it just right. I didn't have any problems with it. Mostly, it's an aesthetics kind of thing. To me, when I opened the notebook, it caught my eye immediately. Some people really dislike something like that; others won't notice it all. I like the size and the lightly gridded paper. I got used to paper grids in interior design school and now gravitate to any sort of grid paper – though I don't like the grid to be heavy. I would love to win one of these. Again I love the funky funky covers and adore the international shipping freedome! This looks like a great little notebook. Would be great to keep in my purse for ideas on the fly. I loved the elastic closure. It will keep things tidy. I love all your reviews on notebooks and journals. I've never seen this one before; but the art you put in yours is sure gorgeous. I have a 102* fever, but even death's door doesn't stop me from a great giveawat. I love different notebook and this will get me to continue with drawing. Thank you for this giveaway. Good luck everyone to win this giveaway. I love the cover design and the grid layout, Hope I win it. 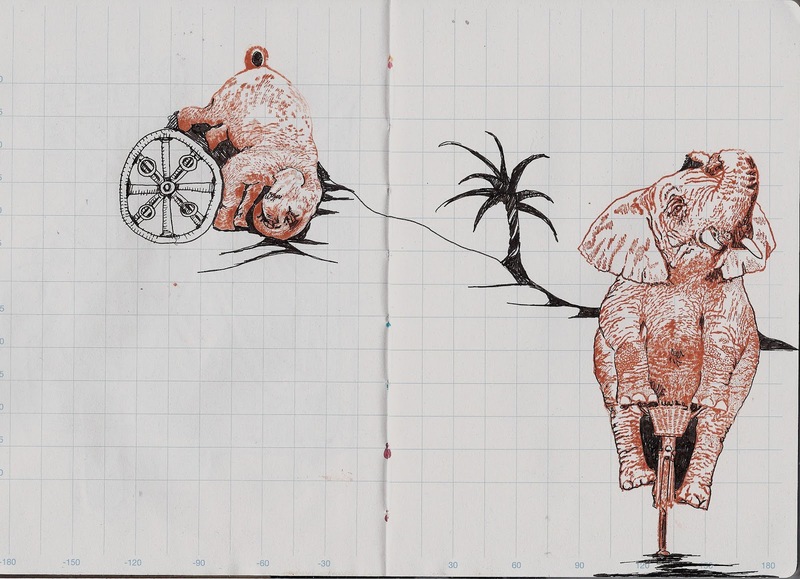 This notebook looks reeeeeeally nice, love the drawings as well! I love the cover… atlases are one of my favorite things and this notebook has such a great design! I love the different kind of graphic paper lines on this notebook. 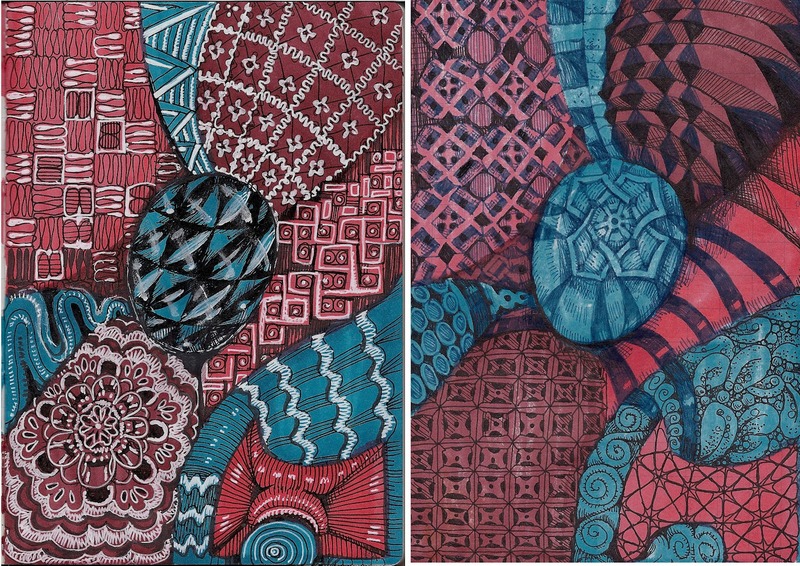 i love the graphic lines too – for more precisely sized tangle patterns. Thanks for the great article and give away.